inspire and rejuvenate the local communities through education, training, improving the environment and providing opportunities to help and engage people from less privileged circumstances. set up a small catering trailer serving light refreshments. 1) The rejuvenation of redundant derelict land on the river has prove highly successful and popular wit local residents and employees. The project will demonstrate the opportunities and potential that community led initiatives can have of their prospects for improving their environment and aspirations, particularly of their younger members. A current pilot scheme run with Jobcentre Plus (DWP) has proved successful and will be continued by mutual agreement. During this scheme where several long term unemployed have participated for an agreed period two are back in employment and others have demonstrated the benefits they received by requesting to continue their involvement. We now have a solid and growing base of support with volunteers joining bringing a wide range of useful skills and experience including a volunteer who taught numeracy and literacy to young offenders. This is about encouraging people to share their skills and experiences so that it benefits others. Interest from local firm on the adjacent business parks has been growing with one firm sending regular teams of volunteers engaged in clearing and landscaping. 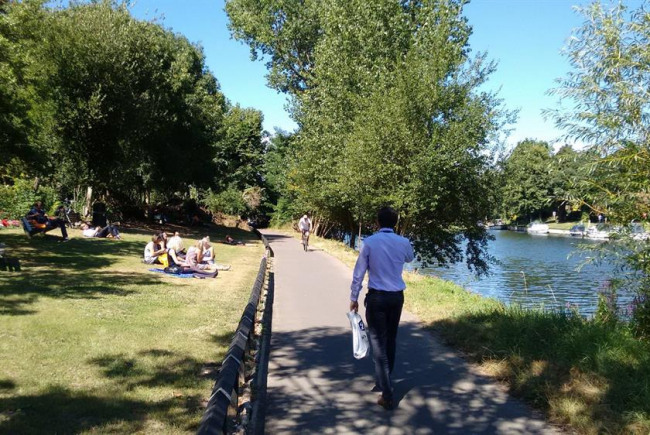 on the River Thames at a A prime location near Staines upon Thames offering great views on the river with an ideal environment for people to enjoy a rest be it for lunch, a cup of tea, a picnic and simply to take in the ambiance. Previously worked in local authority leisure provisions before qualifying in IT and spending ten years as an IT Support Officer with a local authority. Following cutbacks I worked in a completely different field as a seasonal lock and weir keeper with the Environment Agency for five years. This is where I realised the potential and opportunities the River Thames presented to the local communities. From this I drew inspiration to start The Tea Boat Project, presently in its fledgling stage working with volunteers to improve and rejuvenate the local community and offering opportunities to those from lesser privileged circumstance to improve and broaden their future prospects and instil leadership skills to enable them to take responsibilities in their communities. Project Delivery Manager: Aristide Zoides The Project Delivery Manager takes legal responsibility for receiving and spending the funds raised and ensuring the project is delivered.